BleachHouseLibrary.ie: Exclusive Cover Reveal, Excerpt and Giveaway - "The Girl From The Savoy" by Hazel Gaynor. Exclusive Cover Reveal, Excerpt and Giveaway - "The Girl From The Savoy" by Hazel Gaynor. The Girl From The Savoy is now available for pre-order, with its ebook publication date 9th June 2016 and the paper back publication date 8th September 2016. The new rich and compelling novel from the author of The Girl Who Came Home. Perfect for fans of Kate Morton and Rachel Hore. Dolly’s proximity to the dazzling guests makes her yearn for a life beyond the grey drudgery she was born into. Her fortunes take an unexpected turn when she responds to an unusual newspaper advert and finds herself thrust into the heady atmosphere of London’s glittering theatre scene and into the sphere of the celebrated actress, Loretta May, and her brother, Perry. All three are searching for something, yet the aftermath of war has cast a dark shadow over them all. A brighter future is tantalisingly close – but can a girl like Dolly ever truly leave her past behind? I’m very excited to introduce you to my forthcoming novel THE GIRL FROM THE SAVOY, and to share the beautiful cover for the Ireland/UK edition! Set in London in the early 1920s, this was such a fascinating novel to research and write, taking me ‘downstairs’ with my character Dolly Lane, a chambermaid at one of London’s most iconic hotels, and onto the West End stage with Loretta May, a renowned actress. Following the aftermath of the Great War, the novel also took me to the battlefields of France, and into the minds of the men and women still struggling to come to terms with their experience of war. Through the contrasting lifestyles of my leading ladies, through their leading men, Teddy and Perry, and through the cast of supporting characters, I hope to have written a novel rich in emotion and passion; a novel that will take you back in time, to London in the 1920s. The book will be available in Ireland on 9th June in ebook and paperback. In the meantime, here’s a little taste of what’s to come! In my heart, I always knew he would go; that they would all go, in the end. Now the dreaded day has arrived. Teddy is going to war and there is nothing I can do to prevent it. Everything is a blur. I don’t remember eating breakfast. I don’t remember laying the fires or doing any of my usual chores. I don’t remember hanging up my apron or putting on my coat and hat. I’m not even sure I closed the door behind me as I set off for the station, but I must have done all these things because somehow I am here, standing on the platform, and he is pressing a bunch of daffodils into my hands. Somehow, he is really leaving. I want to believe him, but we all know the truth. Nobody comes back. The thought breaks my heart and I gasp to catch my breath through my tears. Mam had warned me not to be getting all maudlin and sobbing on his shoulder. “You’re to be strong, Dorothy. Tell him how brave he is and how proud you are. No sniveling and wailing.” And here I am, doing everything she told me not to. I can’t help it. I don’t want to be proud. I don’t want to tell him how brave he is. I want to sink to my knees and wrap my arms around his ankles so that he can’t go anywhere. Not without me. I nod and press my cheek to the thick fabric of his coat. A quiet simple life. Just like we’ve always wanted. I try to ignore the voice in my head that whispers to me of more than a quiet simple life, the voice that speaks of rowdy adventures waiting far away from here. “Head full of nonsense.” That’s what our Sarah says. She’s probably right. She usually is. A loud hiss of steam pierces the subdued quiet of the platform, drowning out the muffled sobs. Doors start to slam as the men step into the carriages. Embraces end. Hands are prized agonizingly apart. It is time to let go. I reach up onto my tiptoes and our lips meet in a last kiss. It isn’t lingering and passionate as I’ve imagined, but rushed and interrupted by my wretched sobs and the urgency of others telling Teddy to hurry along now. We part too soon and he is walking away from me. I can hardly see his face through the blur of my tears. The shrill blast of the station master’s whistle makes me jump. Mothers and daughters cling to each other. Wives clutch their children to their chests as they bravely wave their daddy good-bye. Great clouds of smoke billow around us and I cover my mouth with my handkerchief as the pistons yawn into life and begin turning on their cranks. The carriages jolt to attention, and he is going. I start to move, my feet falling in time with the motion of the train, slow at first, and then a brisk walk. All along the platform, women and children reach out, clinging for all they are worth to prolong the very last touch of a coat sleeve, a fingertip, the last flutter of a white handkerchief. And I am jogging and then running, faster and faster, until I can’t keep up and he is gone. I slow to a walk and stand among the suffocating smoke as my heart cracks into a thousand shards of helpless despair. Everything has changed. Everything will be different now. I put my hands in my coat pockets, my fingers finding the piece of folded paper in each. I glance at the hastily scribbled note from Teddy in my right hand: Darling Little Thing, Don’t be sad. When the war is over, I’ll come back to you, back to Mawdesley. With you beside me, this is all the world I will ever need. I glance at the page in my left hand, ripped from the morning paper as I lay the fire in Madam’s bedroom. Society darling and brave nurse virginia clements revealed as west end star loretta may! I look at her beautiful face and elegant clothes, the perfect image to accompany the glowing report of Cochran’s latest dazzling production and the enchanting new star of his chorus. I stare at the two pieces of paper. The life I know in one hand. The life I dream of in the other. The church bells chime the hour. Time to go back to the Monday wash and the predictable routines that carve out the hours of a maid-of-all-work like me. Wiping the tears from my eyes, I fold the pages and return them to my pockets. I turn my back on the distant puffs of smoke from Teddy’s train and walk along the platform. The surface is icy and I go cautiously, my footing unsure. I slip a little, steady myself, and keep going. Crossing the tracks, I step onto the frosted grass verge that crunches satisfyingly beneath my boots. On firmer ground, my strides lengthen and I walk faster, and all the while the question nags and nags in my mind: Am I walking away from my future, or walking toward it? I don’t have an answer. It is not mine to give. War holds all the answers now. 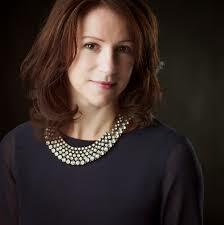 Hazel Gaynor is the New York Times and USA Today bestselling author of THE GIRL WHO CAME HOME and A MEMORY OF VIOLETS. She was selected by US Library Journal as one of ‘Ten Big Breakout Authors’ for 2015 and received the 2015 RNA Historical Romantic Novel of the Year award for THE GIRL WHO CAME HOME. A MEMORY OF VIOLETS was a WHSmith ‘Fresh Talent’ pick. As features writer for writing.ie she has interviewed Philippa Gregory, Sebastian Faulks, Kate Mosse, Jojo Moyes and Cheryl Strayed, among others. Hazel has called Ireland home for the past fourteen years. She lives in County Kildare with her husband and two children. 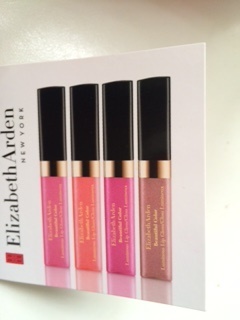 To celebrate the cover reveal of The Girl From The Savoy, I have an Elizabeth Arden gift set to giveaway. 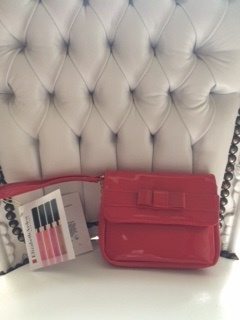 A small clutch, containing four lipglosses, this is sure to appeal to lovers of all things glam! Just enter via rafflecopter link below. Giveaway is open INT. Good Luck! Hey M, lovely plot n cover isn't it. I saw the US cover n that's cool too. Looking forward to read this. Another of Hazel's book is A Memory of Violets. The Girl Who Came Home & A Memory of Violets. The Girl Who Came Home and also (co-wrote) Fall of Poppies. A Memory of Violets-beautiful cover. I loved Hazel's previous books. 'The girl who came home' was my fave read of 2015 and I really enjoyed 'a memory of violets' so was really excited to hear about her latest book. I cannot wait to read this one!! The Girl Who Came Home and A Memory of Violets. A memory of violets x. mmmm....YES, A Memory of Violets. The Girl Who Came Home is another of Hazel Gaynor's excellent novels! "Even The Dead" by Benjamin Black. Book Review.